I was amazed - after training with the master, Rodrigo Matos at Morgado Lusitano in Portugal only 3 months ago, here he was in Queensland! Rodrigo held a 3-day classical dressage clinic in the huge indoor arena at Antrim Stud in Allora, approximately 2 hours west of Brisbane. You need to be "in the know" to get a place in the clinic & all the days were full! He runs a crazy clinic schedule, taking himself all around the world - in Australia for a week or so, then to New Zealand, Europe & back to us early next year. Although I was without a horse this time, when he returns in MARCH 2013, I'll be ready to join in! Training Classical Dressage in Portugal! Being self-employed, professional development is my own responsibility and I spend time each year taking advantage of opportunities to work with visiting coaches and trainers to improve my riding and teaching. Yes, it really was the trip of a lifetime! The original idea had surfaced more than a year previously. As my partner is fluent in Spanish, it had been a dream of his to spend a few months living in Spain, improving his grasp of the language. Of course I thought - well, that’s just next door to Portugal! I had been hearing wonderful things about their national breed, the Lusitano, for many years. People in SE Asia had begun importing the breed for dressage and general riding, plus famous dressage trainer Kyra Kirkland is in love with Iberian horses and had been expounding their superior qualities for some years. What an opportunity to find out what it’s all about! A couple of equestrian friends were instrumental in my decision of where to train. They had both been to different places in Portugal and had great experiences. I had the time, so I thought “why not go to both?!”. Owner and trainer Don Francisco de Braganca is a descendant of the the now-defunct royal family and long-time student of the renowned Nuno Oliveira. His stable is full of impeccably presented, breath-takingly beautiful and solidly trained Lusitanos. The indoor arena and viewing area is incorporated into the stable barn with a large outdoor flanked by fields of lavender and rosemary. Francisco’s focus and absolute priority in training is the correct position of the rider and the correct application of the aids. My first lessons there involved remaining in walk until a true and effective position was achieved. His horses are extremely sensitive and it was always apparent when you hadn’t communicated correctly with your seat, legs, voice...! Spurs were absolutely forbidden and riders were only allowed to carry a stick if it became obvious the horse was unable to decipher their forward aids any other way. Riders learn to take responsibility for any mistakes or unintended/incorrect responses from the horse. As a coach, Francisco is quick thinking, responsive, with an excellent sense of humour - even when yelling at you! Lessons were what we would consider short (25 - 30 min on the horse). All riders spend the entire morning and afternoon sessions together (there can be around 6 guests at one time). As each person rode, everyone stood in the arena with Francisco - observing, discussing and learning. Just a short walk from the barn, the accommodation was just lovely: comfortable bedrooms, plenty of space inside to relax in the cool and an outside pool area. The food was always outstanding - a simple continental breakfast including the requisite meat, cheese, bread and strong coffee, 3-course meals for both lunch and dinner including ample quantities of delicious local table wine. The staff were friendly and helpful; always able to cope with guests not having any grasp of Portuguese! Francisco’s lovely wife Maria appeared over the weekend and we had the special treat of sharing Francisco’s birthday celebration with his family and friends. 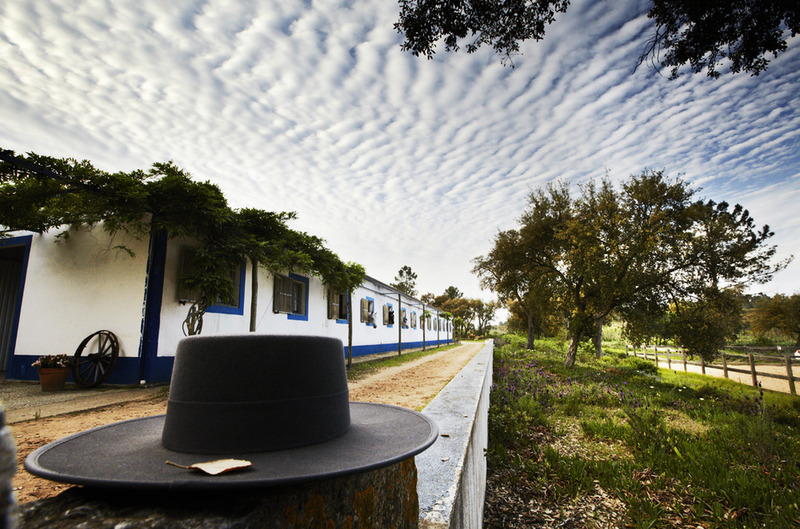 Morgado is a family-owned organisation operating an equestrian vacation and professional training centre. Many of the horses used in the school are bred by the family, who have a long equestrian history in Portugal. Morgado is well set up to accommodate up to eight or so riders of every level wishing to ride horses fully established in grand prix movements. Lesson are usually in a group (2-3 riders) in their large covered arena, unless a private lesson has been specifically requested and can be catered for. Their resident instructors (whilst I was there) Rodrigo Matos and Paulo Sergio Perdigao are top graduates of the prestigious Portuguese Riding School in Lisbon and very experienced trainers of both horses and riders. Both Rodgrio and Paulo travel extensively around the world conducting dressage clinics with riders on every kind of horse, as well as being Iberian horse specialists. Having been well-prepared by Francisco at Archino in terms of my position, I was ready to move on to tackling the more technical aspects of higher level movements. At Morgado, the horses have their specialities - on “Trinco” I was able to experience two-times changes on a circle; on another horse, it was pirouette training or passage/piaffe. All horses were supremely supple and responsive, easily performing shoulder-in, travers, flying changes and criss-crossing the arena in half pass zigzags. Spurs were fairly mandatory and a stick was carried for certain horses known to be a bit lazy! As at Archino, there were morning and afternoon sessions, but it was up to you if you wanted to view other riders’ lessons or slope off for a dip in the pool, a nap or a trip to the local tack shop! The guest dining rooms are located in historic buildings, with the incredible library room as the hub for evening drinkies and internet connection. In comparing the two centres - I'm glad I went to Archino first and worked on my position as I found that it wasn’t focused on at Morgado (maybe because I looked so good?!). What I loved about Morgado was the opportunity to really practice the higher level movements on horses that just did them, no fuss. Without that experience, I would have felt that I was missing moving on to the next step after working so hard on my own riding. But without having first trained at Archino, I would have felt I had skipped a step in practicing and fully establishing my riding technique. There I got more of a sense of the training behind both horse & rider, whereas at Morgado I got to ride the tricks on very rideable horses. Training in Portugal this year has been an immense boost. I mentioned at the beginning that this has been the trip of a lifetime - but taking the opportunities to train at special places such as these is now a priority for me, and I will be heading off again on a regular basis to keep improving my relationship with these fascinating creatures.